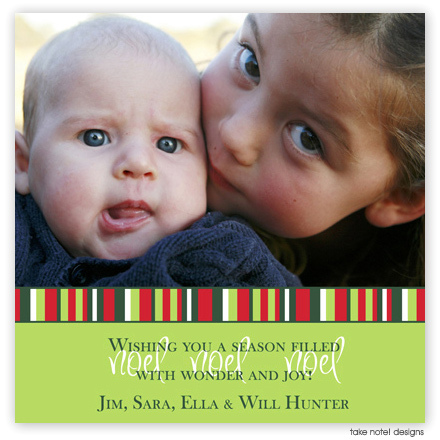 Beautiful and one of a kind, holiday digital photo cards by take note! designs. The card design, your photo, and your custom text will be printed as one flat card design on heavyweight white 120# cardstock. Fonts and text are completely customizable. Note that square cards require additional postage for mailing. First standard proof is free. Subsequent proofs which are requested due to customer error or changes are $5.00 each. YOU WILL BE REQUIRED TO APPROVE YOUR PROOF. YOUR ORDER WILL NOT BE PRINTED UNTIL THE PROOF IS APPROVED. RUSH proof fee ($6) gets the proof to you in 1-2 working days and RUSH processing ($20) shortens the production time to 2-4 working days after proof approval. Note, if ordering printed envelopes, RUSH processing charge will be $30. Your original photo will be cropped to fit the design. Please set your camera to its highest setting before taking your photo. Please click the link above to read about our photo requirements. You should reply to your order confirmation and attach your original (uncropped) photos or email them to us at orders@morethanpaper.com with your order number referenced. Pricing for holiday cards includes the printing of the card's backside pattern as shown. For an additional $10 fee, you can choose to customize the back of the card with the addition of a photo and/or text. Baskerville and Inspiration shown. You can choose up to 2 typestyles and let us know where they should be used. Wonderful matching self-adhesive return address labels available for an additional fee. 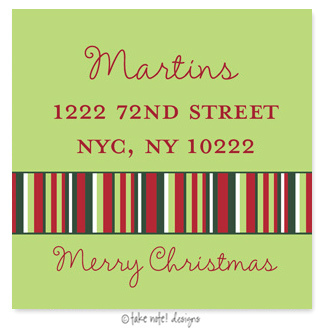 Great for use on your envelopes or gifts! You specify the typestyle and text to be printed. Your return address may be printed on the back flap of the envelope in your choice of typestyle (in black ink only) for an additional fee. A PROOF APPROVAL is required. A FREE PROOF will be emailed to you in 1 working day after your order is placed. If additional proofs are necessary due to customer error or changes, you will be billed at $5.00 each starting with the THIRD proof. with text and/or a photo? If you are customizing the backside, which style? If using a photo on the Backside, how should it be printed? Do you wan any Matching Address Labels?